One of the major local export­ers of Tuna has opened an outlet in Suva, complete with its own seafood cafe. Golden Ocean Fish Ltd Sales and Marketing manager Ana Delailo­maloma said the opening of the Golden Ocean Seafood shop is a decent way of marketing Golden Ocean Fish Ltd company locally too. The outlet and cafe are in the new Flagstaff Plaza. Golden Ocean Fish Ltd’s head­quarters is in 33 Freeston Rd, Walu Bay, Suva. On the cafe, Ms Delailomaloma said: “We see a need for a nice sea­food cafe like the ones abroad. “We have friends, family, clients that have been asking us for years to open up an outlet where they can get their fresh sashimi, because it’s quite hard to get them locally so when the space was available, we thought…ok it’s about time to do something here in Suva. “A lot of people are now adopting good eating habits, so we believe that opening this shop would do many of us a favour. “Apart from having fresh sashimi we thought of making available all our export products locally too. All those products in our freezer is what you will find in big supermar­ket chains in USA, France, Neth­erlands, Spain, Australia and New Zealand. 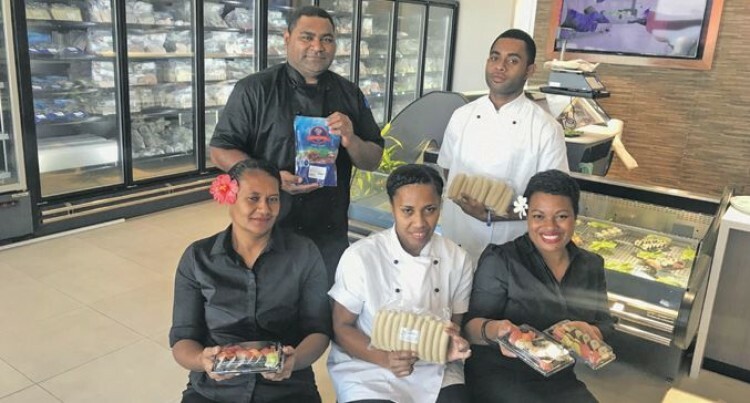 “We wanted the café in the shop for our customers to also try out the different variety of fish prod­ucts that we have available and dif­ferent ways of preparing and cook­ing fish and other seafood available to us in Fiji. “It’s more like educating the pub­lic. Saturdays we would combine our fish with other local seafood giving it a local twist like the cawa­ki nigiri, nama poke, lumi sushi. “We also like to use local seafood and produce in season to create our menu like our Tuna and mango su­shi for example. Now avocado is in season you will see avocado in most of our food,” Ms Delailom­aloma said. SunBiz asked Ms Delailomaloma, what’s so different about their business? She responded: “One, we don’t sell any fizzy drink at all, only drink available is water, coconut juice and freshly squeezed lemon juice. “Two, you will also notice we don’t put salt on the table for our custom­ers to use, we give salt on demand. We give our customers the option of salads, rice or potatoes as their sides to promote healthy eating. “Our managing director, Mr Du himself came up with the design. I remember, going to our shop al­most every day with Mr Du, sketch­ing and mapping out how we want the place to look, then we engaged Design Hut which was also our pro­ject manager. The interior decora­tion is done by Neil Foon. “The shop alone is a very tiny bit of our business.